Comedy’s not pretty, to be sure. After all, how can you take solace in a world in which Cougar Town is still on the air and Arrested Development isn’t? Today we take a look at six comic actors, writers and stand-ups — some brand new, some seasoned — who sorely deserve more looks than the entertainment industry has shown them. Feel free to add your own suggestions in the comment section below, and let’s light a torch for those who fly under the radar. Andrew Daly — Ex-Mr. Show writer Scott Aukerman’s top-notch podcast Comedy Death-Ray has become the go-to spot for the “alt-comic” and stage comedy scene, combining great interviews with bizarre and long-form character improvisation. One of the strongest pointmen for the latter is Andrew Daly, a UCB performer who single-handedly stole almost every scene he was in as Principal Terrence Cutler in HBO’s Eastbound & Down (no mean feat when one’s up against the great Kenny Powers) and consistently turns in quick and clever characters for Comedy Death-Ray like Bill Carter, Trainer to the Stars, whose training regimes involve extortion and black magic; Hot Dog, a hipster baby boomer whose several failed auditions for doo-wop tribute artists Sha-Na-Na may lead to his unfortunate suicide; and horribly depressed German tourist August Lindt. Hannibal Buress — 27-year old Hannibal Buress is not only making his name in the Chicago and New York comedy circuit, he’s also getting noticed by the right people. The dry, funny stand-up comic has already graduated from a writing gig on Saturday Night Live in 2009 to a writing gig for 30 Rock in 2010 and deified by Chris Rock in a recent Esquire interview as being “the next guy” (read: the next big guy) Want more proof? Download My Name is Hannibal, Buress’ sidesplitting and very solid live stand-up album, from iTunes. Nick Kroll — Another favorite from Comedy Death-Ray is Kroll, whose improv characters include the mythical Mexican beast El Chupacabra, hotspot man-about-town Bobby Bottleservice and craft service manager Fabrice Fabrice. His recent Comedy Central stand-up special Thank You Very Cool was long overdue, as Kroll’s appearances and contributions to HBO’s Life & Times of Tim, Tina Fey’s Date Night, MTV sketch show Human Giant, VH1’s sorely missed Best Week Ever and other pedigreed programs mean Kroll’s not only well-connected but well-respected in the L.A. comedy community. Chris Pratt – Sure, Aziz Ansari is the hip-comedy draw for Amy Poehler’s ensemble Parks & Recreation, but ex-waiter (discovered by Rae Dawn Chong, no less) Chris Pratt’s Andy Dwyer has snuck up to become one of the cast’s most consistently funny characters. Not bad for a guy whose role in the first season was a temporary one, which spent every scene in a full-body cast. Andy’s dense sweetness — his relationship with the sardonic April is played pitch-perfect — helps him to sell any line like it’s the best in the episode, and he may be is the funniest thirty year-old shoeshine boy on television today. 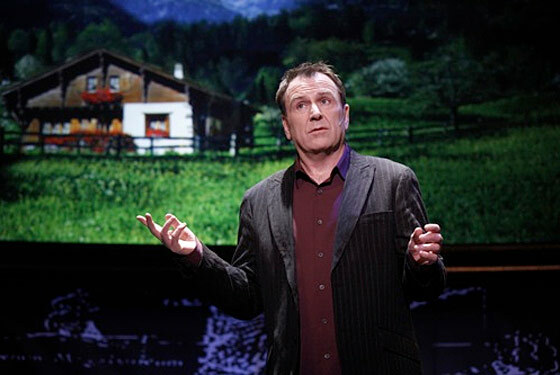 Colin Quinn — I’ve spent a large part of my life defending Colin Quinn; he’s one of those love-him-or hate-him comics, apparently. From his short stint as SNL’s Weekend Update anchor to his canceled stand-up forum Tough Crowd, it seems I’ve spent a lot of time in bars extolling his virtues to deaf ears. Finally, however, my fondess has been validated: Quinn’s Long Story Short — a stage show recapping the world’s greatest civilizations directed by pal Jerry Seinfeld — continues to succeed on an ailing Broadway with glowing reviews and is nearing a national tour. Consider it some just desserts for journeyman Quinn, who has certainly taken the long way around. Michael Showalter — The State alum can’t seem to get anything to stick, which is a shame because he handles meta-comedy as well as anyone in the business today. Formerly a member of beloved absurdist troupe Stella and the lead in the vastly, vastly underseen Wet Hot American Summer, each new project Showalter’s involved with is guaranteed to be comically outside the norm. In a good way. His book Mr. Funny Pants, which exists as a sort of bizarre anti-autobiography, is available in hardcover now, and it’s a great example of why Showalter deserves more exposure.